Snam’s infrastructure is present in nearly every Italian region, in areas and communities with different cultures and traditions as well as different economic, social and environmental conditions. In this context, Snam’s policy is to build new infrastructure and manage existing infrastructure, adopting a rigorous, transparent and cooperative approach to ensure that establishments are environmentally compatible and to encourage their acceptance by stakeholders. The Company cooperates with local and national authorities, participates in the work of several associations and committees and provides its commitment and expertise to encourage improvements in the area of sustainable development. During the year, 127 meetings were held with local governments and regional associations to describe construction projects in the transportation sector. In this context, a network of ad hoc relationships was developed with Confindustria’s regional offices and with other local companies operating in the association system partly to cover issues of energy, economic and environmental policies having an impact the region. In recent years, the Snam Group has consistently increased the presence of its employees on the management boards of Confindustria associations, but also of associations for relationship and environmental purposes in support of its business. In order to carry out high-value specific actions for itself and the region where it operates, Snam runs its business by reconciling economic goals with social and environmental goals in the context of future sustainability thereby establishing a closer relationship between business and corporate social responsibility. The “shared value” projects that Snam develops by making know-how, space, expertise and transactions available to various regional counterparts (community, regional and school representatives, suppliers, customers, etc.) reflect the company’s commitment to ensuring that the sharing of its resources will contribute to an improvement of several needs in the region. Around €765,000 has been spent on donations, sponsorships and local initiatives, excluding environmental compensation. In school year 2013-2014, the first edition of the project called ““Stories that tell the future” that fits within the framework of sustainability activities aimed at strengthening at the stakeholders and the territory, the awareness of how Snam acting with responsibility for the environment and society. The aim of the initiative called ““Stories that tell the future. Travel to the discovery of the Network””, is to encourage the company to interact with schools, with the involvement of executives, teachers, students and families. 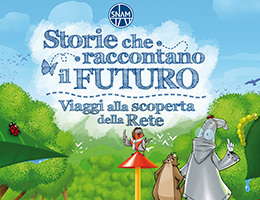 This project, which was conceived with the collaboration of Federparchi and with the sponsorship of the Ministry for the Environment, Land and Sea consisted of an educational course targeting students in grades 3, 4 and 5 of Italian elementary schools and schools at the same level in several European cities, and it covered the subject of biodiversity encouraging students to care for and safeguard the common good. The initiative involved the participation of 333 schools consisting of 946 classes with the direct involvement of over 18,000 students and 591 teachers. Based on requests, 1,000 kits of materials were distributed throughout Italy: 40.4% to central Italy, 36.7% to the South and 22.9% to the North. A competition of ideas for students to make a creative contribution was announced in connection with the project. A large selection of approximately 2,000 collected drawings became a temporary exhibit held in a Botanical Gardens in Rome with about 380 visitors, including 270 children, over three days. The top ranking three schools were awarded an interactive multimedia blackboard, and another ten were awarded a special mention at an event held at the Botanical Gardens. The event also served as an opportunity to launch the project for the new school year which is dedicated to science and innovation.